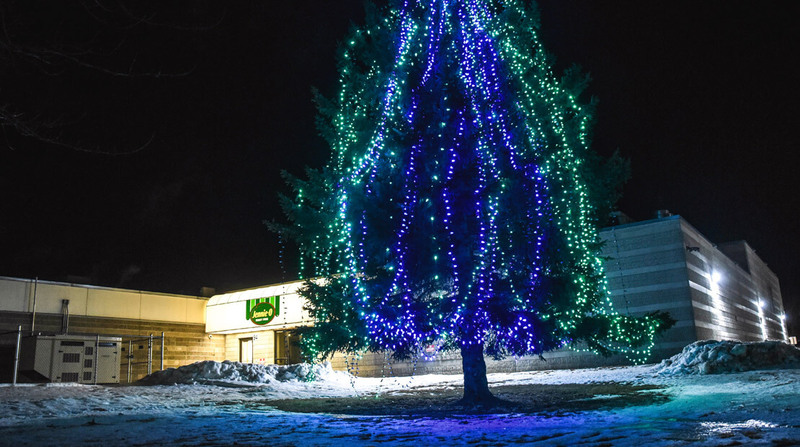 Last month 5,000 blue and green lights were lit on the “Tree of Hope” at the Jennie-O Turkey Store headquarters in Willmar with the promise the lights would stay on until Jayme Closs was found. Now those lights are shining in celebration that Jayme has been found alive. Three months ago, the 13-year-old girl went missing on the day her parents, James and Denise Closs — who both worked for Jennie-O in Barron, Wisconsin for 25 years — were murdered. On Thursday news broke that Jayme had been found alive after escaping from a rural house in Gordon, Wisconsin and that a 21-year-old suspect has been arrested. “A lot of tears of joy were shed,” said Jennie-O President Steve Lykken. Pat Solheid, Jennie-O vice president, said the entire Jennie-O and Hormel Foods family, are “overjoyed” Jayme was found safe. Right before Christmas, the Willmar Jennie-O team lit a Tree of Hope and the Barron team joined with the community to light a Tree of Hope there. At the Barron ceremony the Willmar staff sent wish lanterns into the air. “Yesterday, our wishes were answered,” Solheid said. Solheid said they want to give special recognition to law enforcement officials for their “dedicated and tireless efforts in finding Jayme,” including Barron County Sheriff Fitzgerald and his team of officers.